Returning for the fourth year, the Colorado Cider & Beer Circus is coming to Copper Mountain with a large selection of craft cider, beer and eye-catching entertainment. “We can’t think of a more fun way to enjoy awesome craft beer and cider, than by watching aerial artists fly above your heads and a headliner band jamming on stage in front of a pile of snow,” said festival director Stephanie Carson. The cider-centric festival being held on Saturday, August 25, 2018, features many of Colorado’s growing number of craft cideries and is supported – in part – by the Colorado Cider Guild. Cider is one of the fastest growing alcohol options in the industry – with the demand for gluten-free options and non-beer choices increases. With its ideal climate for apples and a large number of talented cider makers – the Cider Circus is proud to showcase that,” added Carson. Let Salida Circus Wow you with their skilled performances. 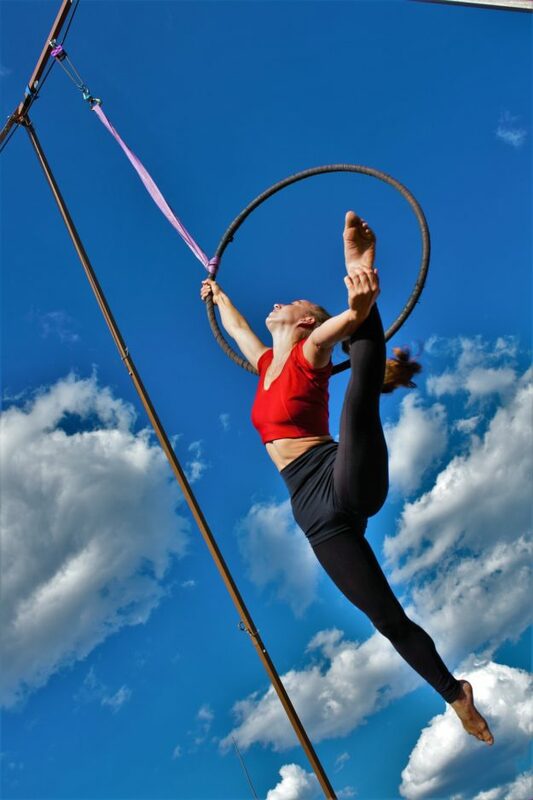 The Salida Circus will be performing at this year’s festival, offering aerial arts and other circus-style entertainment. The festival is family-friendly, with plenty of kids activities available in Center Village. Copper provides the ideal environment for such an event, with its reputation for fun, out of the box activities. Come for the Special Reserve Sampling that will showcase five cider and cheese pairings on Friday evening. Saturday will be the main event where it’s possible to sample craft ciders and brews while enjoying jugglers, mimes, clowns and acrobats. Sip and enjoy live music with featured entertainer Salem and performances by Salida Circus and Hobo Village. “We pride our Mountain on providing a place for people to let their hair down and enjoy our wide variety of activities. From our new Mountain Coaster to zip lining across Center Village – this is a place to make memories,” said Holly Robinson, Marketing and Business Development Manager for Copper Mountain Resort Association. Refreshing and delicious, the Cider Industry has become a player in the competition to win over your taste buds. These refreshing, crafted ciders are no longer the sweet, heavy concoctions of yesteryear. Today cideries are creating light, dry and refreshing drinks. The Colorado Cider & Beer Circus is the perfect way to give them a try.